Skalkottas' Thirty-Two Piano Pieces (originally titled in German 32 Klavierstücke) is one of the composer's most monumental creative achievements, this from a composer whose work often enough tended to monumentality (e.g. the gigantic seventy minute long Second Symphonic Suite, the Third Piano Concerto and Fourth String Quartet, the twenty-five minute overture, The Return of Ulysses, the monumental Sonata for Basson and Piano, and the evening-long Cycle-Concert). 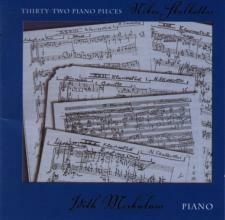 The Thirty-Two Piano Pieces are not only monumental in scope and duration -- a complete performance lasts one and a half hours -- but also in their at times superhuman (or 'inhuman') technical demands. Yet, they were written in an astoundingly short period of time, apparently in three short bursts of one week each during the months of June, July and August of 1940.